If you’re an independent insurance agent, you already know how important it is to be in touch with your clients. Maybe you started out really strong — you just sold the policy, you sent a follow-up email a few days later, you called a few weeks after that, and you even sent a birthday card! However, too many agents get comfortable and lose that momentum, causing their clients to go through a downward spiral resulting in confusion, and ultimately, a willingness to ditch you. This doesn’t have to be you. This complete guide will cover all of the questions you have regarding annual policy reviews. While holding these reviews, it’s your obligation to point out gaps in coverage. Your client may decide they don’t want to pay for the coverage you’re suggesting, and that’s OK. However, if you set up the problem in a clear, well-thought-out way that makes sense for your client, you’re much more likely to be successful. 1. Review your client’s policy on an annual basis. A lot can change in a year, and you want to be there to explain these changes to your client. They need to know about things like rate increases or coverage that’s missing. It’s possible that a lot of people have no clear idea of what their policy covers. If there’s a gap somewhere, you need to make sure you’re at least educating them on potential solutions. 2. Do not wait for the annual election period. You’re already crushed for time, and getting yourself in front of your client will be that much more difficult. Your client wants to feel valued and appreciated. If you’re swamped, there’s a huge chance you’re going to make your client feel rushed (whether you mean to or not). Give yourself a break and treat your client as a priority by scheduling these annual reviews at another time. 3. Set expectations by establishing a time limit. Let clients know how long the review will take. This will help you stay on track while also preparing them for what’s in store. If they’re expecting it to take 15 minutes and you take over an hour, they’ll be wondering when this thing will be over instead of reaping the benefits of the meeting. If they’re expecting a 2-hour presentation and you’re in and out in 10 minutes, they’ll feel underappreciated and overlooked. We suggest that you set a 1-hour time limit on your policy review and let your client know beforehand what to expect. Doing a policy review is a fairly straightforward process, but it’s important that you’re thorough. If you have a hard time remembering the details or are doing a ton of policy reviews during a short time period, it can be really useful to keep a cheat sheet with the basics jotted down. If you’re quick and on your feet about the details of your client’s policy, you’re setting yourself up as a trustworthy and credible agent. For example, let’s say you’re reviewing a life insurance policy. What kind of life insurance policy is it? Term life, whole life, universal life, or variable life? Are there any riders? Jot that down. Who is the insurance carrier? Aetna, Equitable, Prudential, John Hancock? Jot this down and double-check it before your meeting. The date issued is very important, especially when it comes to life insurance. For example, term insurance has an expiration date, while permanent insurance has a surrender charge that might apply if you cancel the policy during a certain timeframe. You need to make sure you have this information readily available so you can explain this to your client. What is the premium your client is paying? How often do they pay it? Who receives the benefits? Your client, his or her spouse, his or her children? For life insurance policies, make sure you know who the beneficiary is. You always want to check this during your review as the client may request a change. If you’re jotting all of these details down, it can be handy to type them up and give the print-out to your client once the review is complete. If you do this every year, you’re making sure your client has all of the up-to-date information, and it’s no extra work for you. Once you have the basics ironed out, start looking at the details of the policy itself. What are the features of the policy? How would I qualify for the benefits? How much do I/will I pay? Is there any duplicate coverage? Do I need this much coverage? Are there any gaps in my coverage? You also need to make sure their coverage amount is sufficient and that it will last for the time duration they want. For example, term life is bought to cover a specific number of years in the event of an untimely death. If the insured dies, would the mortgage be covered? What about income replacement to live? What about the kids’ college education? Another example would be old Universal Life policies that could be in jeopardy of not lasting until one's death. If an old policy wasn’t funded correctly, it won’t be there when the client really needs it. If you can comfortably answer to these questions and scenarios, you’re ready to hold the review. If there is any part of this that you are unsure of, make sure you find the answer beforehand. You will lose trust from your client if you aren’t schooled on what you’ve sold them — no one wants to buy a house from a real estate agent that knows nothing about the school district. If you have partnered with New Horizons and don’t know the answer to one or more of these questions, contact us and we will be glad to help you figure it out. Now that you know the basic information about the policy and have fully reviewed the details, you need to take a step back to think about your specific client. How old is he/she? What is his/her family history? Is he/she married or alone? Does he/she have kids? What are the most recent statistics on things like seniors in nursing homes or women with cancer? If you can put their policy in context based on who they are and the world we live in, you can find out 1) if the policy is still relevant and 2) if your client needs to know about a gap in his or her coverage. You need to get in front of your client. 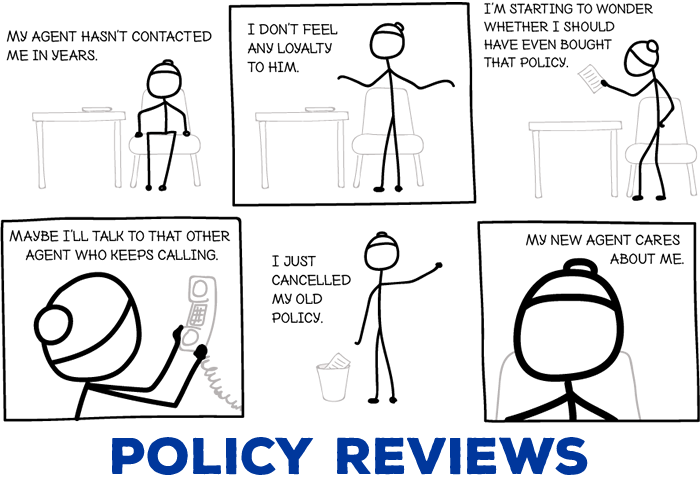 Avoid doing policy reviews over the phone if you can. If you live too far away to meet in person, ask your client if they can meet via video chat. Almost 30 percent of seniors 65+ have a smartphone1, and the use of Skype among the elderly is rising2, so it’s at least worth asking. If your client is interested in chatting via video call but doesn’t know how, you can direct them to this Skype explanation and tutorial from Super Seniors. Meeting in person also demands accountability. If you’re making a request to your client — we really need to consider adding an LTC rider to your life insurance policy — being face-to-face will drive them to make that decision and stick to it. We recommend meeting your client at his or her house. They’re in a comfortable space and you’re showing your desire to be on a more intimate level by taking the initiative to come to them. If you work in an office space or at home, you can always give your client the option to meet you there as well. If you’re a seasoned agent, you probably already have this down. You know how to structure your meeting, you’re really good with small talk, and it feels like a completely normal event. However, for new agents or agents that have never does a policy review before, we’re going to get down to the essentials so that you have a guide to work with. Feel free to tweak our suggestions and add your personality to our script examples, but use these recommendations to help steer you in the right direction. You’ve scheduled an appointment with your client. You’ve established an expected time limit with your client. You’ve made notes of the policy’s basic information. If typed, you’ve printed this basic information to give to your client at meeting’s end. You’ve reviewed the policy’s features and fully understand what is covered and how the policy works. You have pinpointed gaps in coverage and have solutions that you’re ready to present. You have everything you need to have a successful meeting, but it can still be difficult to execute it properly. Here is the general order of operations to follow for the most success. You knock on the door, shake hands, and sit down. You’re ready to begin. So, what do you first? 1. Begin by outlining everything this meeting will cover. “So, we’re going to review your policies, and we should be done by about [name approximate time here]. To give you a general idea of what we’re going to cover, I want you to know that I’m first going to go over the basic information about your policy. I’ll then ask you if you’ve gone through any major life changes so that we can make sure this policy still makes sense for you. Then, I’ll go over the details of your policy, such as what it covers and any important changes like rate increases. Not only does this give your client a basis for what will take place, but it reminds you of your structure, which will keep you from going on unnecessary tangents. 2. Go over the basics of the policy at hand. This step will be really easy for you if you have your cheat sheet ready to go. This is largely a refresher for everyone. You’re making sure you’re both on the same page while also getting the conversation started in a way that makes sense. Go through your list one-by-one and simply state the information about the policy at hand. 3. Ask your client if he or she has gone through any major life changes. Checking up on major life changes like these will help you determine if the current policy is the best option, and it will inform how you proceed with the rest of your review. If you need help with this, we have a 5-part series on Client Needs Assessments that will guide you through the process. 4. Get into the details of the policy. Start talking about the details. What does it cover? Has anything changed? What kind of coverage is missing? Yes, you’ve already told your client what the policy covers when they first applied for it, but reminding them of this reinforces its value and eases concern for a client that wonders if the premium they’re paying each month is really worth it. If you’re meeting with a client that bought the policy from someone else, this is your chance to shine. They may have no idea what the policy is, so going over the details is that much more important. Going over rate increases or concerns about the policy — how is the interest rate, is there any danger of lapsing, etc. — is what your client is really interested in. Give them peace of mind and let them know if there anything to worry about. If there is, offer up a solution. For example, if a different company recently started offering the same benefit for a better rate, you might suggest switching carriers. 5. Discuss coverage gaps and general suggestions. If you’ve spent some time in the planning stage, you have a good idea of where this portion of your meeting is going. For example, let’s say that your client has Medicare A/B and a Plan G Medicare Supplement. You can tell right off the bat that they aren’t covered in the life insurance or LTC department. In this case, you might take some time to educate them on the options. At the heart of this discussion is your ability to make a case and close the sale. Sure, you will see a great commission from this, but your client needs to know that that’s not your main motive. You need to make the need clear so that they realize the danger they’re in by not being covered appropriately. Here’s an example of a sales pitch geared toward establishing the need for life insurance with an LTC benefit rider. Why does your client need to consider a long-term care option? You need to state the problem. Next, state all of the options. Doing this is vital — this lets your client know that you aren’t pitching something because it will make you commission. You’re pitching it because here are all the options, and yours is clearly the best one. “Medicare won’t help, because it doesn’t pay for long-term care. Your Med Supp can cover up to a certain amount, but it’s not long-term, and it won’t help you in this kind of situation. Medicaid could help, but your income is too high for that option. “When you’re talking to people, it’s always good to have a personal experience. You cannot oversell this when the time comes. Thirty days comes by so fast. My dad is not in one of the top nursing homes — he does have a private room — but you’re over $8,000/month for an average home in Mt. Zion, Illinois. If you don’t have a personal situation, you can always paint a picture. What would it be like if you needed to go into a nursing home? Do you have a way to cover it? Finally, offer your proposed solution. You can flesh out the details at this point with whatever policy you’re recommending. There’s nothing wrong with giving your client some time to think about it, but don’t let your presentation die. Get the process moving by having them submit an application. Not everyone gets approved for long-term care, and there’s no cost to apply, so ask them to simply see if they qualify first. If they’re a little hesitant about long-term care, educate them about short-term care possibilities. Make sure you’re arming your clients with all the information they need to make the most informed, educated decision. 6. Answer any questions, close the meeting, and ask for referrals. When you’re done reviewing the current policies and suggesting new ones, ask your clients if they have any questions. If at any point they have a question that you don’t know the answer to, jot it down and tell them you’ll find the answer and will follow-up with the answer. There’s no shame in not having every answer; your client would rather you be honest than spit out a made-up answer that could end up being wrong. Holding an annual review can be difficult, especially if it’s your first time doing it, but don’t forget the strengths they bring to the table for both you and your client. If our life insurance with a long-term care rider example sparked some interest, download this free letter you can send to your clients to start the discussion.